A new map pinpointing the address of every contributor to Suffolk D.A. candidate Greg Henning reveals that not a single person who has contributed to him lives in a city neighborhood MassINC has found is most disproportionately impacted by his office's jail and prison terms. In a report called The Geography of Incarceration, a series of maps reveals which City of Boston neighborhoods are the most impacted by jail and prison sentences. As the above map shows, these neighborhoods also tend to be the most highly segregated by race. The four neighborhoods most disproportionately impacted by the jail and prison admissions and releases depicted in these maps are Franklin Field, Grove Hall, Codman Square, and Dudley Square. 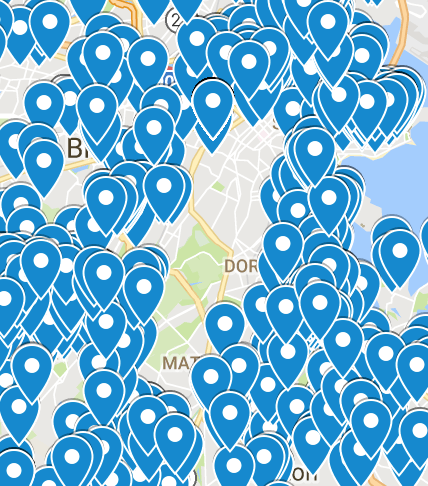 The above screenshot comes from a Google Maps file, which was created in technical partnership with Kristin Johnson, and which geolocates every address associated with a political contribution made to Suffolk County D.A. candidate Greg Henning in the OCPF database. In the center of the photo, there is a large hole that includes all four of the above neighborhoods. 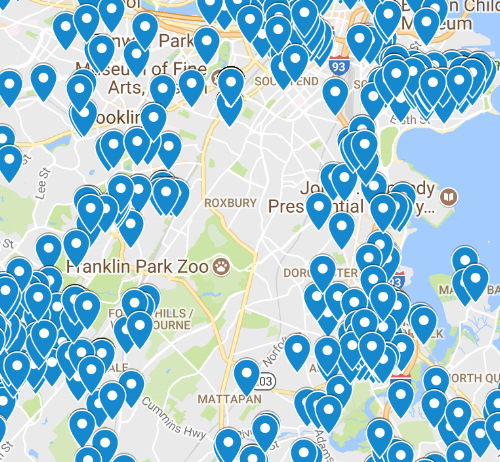 Zooming one frame further, above, the geographic hole in Henning's contributions begins to almost completely overlap with the areas that have the most red and blue dots in the MassINC map. Two frames in from that, in the side-by-side comparison below, the overlap becomes nearly complete. Incredibly, it appears not a single contribution to Greg Henning's campaign has come from any of the neighborhoods where his office prosecutes the vast majority of its cases. What this means is that not one victim, family member of a victim, witness, or any other person Henning has gone to bat for in handling "thousands" of criminal cases, including dozens of jury trials with multiple victims and witnesses in both shootings and homicides, nor any of the students he taught, young people he has "mentored," nor any of their parents or adult relatives, has ever seen fit to contribute to him from an address in the areas where his work in the D.A. 's office has been centered for more than a decade.